AP #ECET 2019 hall tickets, Entrance Exam date, APECET halltickets: Andhra Pradesh Engineering Common Entrance Test APECET 2019 will be conducted by JNTUA, Ananthapuramu on behalf of Andhra Pradesh State Council of Higher Education (APSCHE) for Diploma Holders of Engineering Technology/ Pharmacy and B.Sc. Graduates (with Mathematics) for admission through lateral entry at 2nd year level into B.E./ B.Tech./ B.Pharmacy Programmes offered in Universities, AICTE/PCI approved Institutions in A.P. for the academic year 2019-2020. APECET officials invited the online applications from the eligible candidates through online mode at www.apecet.org from 18-02-2019 to 27-03-2019 for admission into B.E./B.Tech./B.Pharm Courses for 2019. The he Hall tickets for the Andhra Pradesh Engineering Common Entrance Test (AP ECET) will now be released on April 20, 2019 on the official website, sche.ap.gov.in. Earlier, the Hall tickets were scheduled to be released on April 15. Apart from this, the exam date of AP ECET 2019 has also been postponed to April 30, 2019. Steps to download the AP ECET Hall tickets 2019: First visit the official website, sche.ap.gov.in. Click on the link 'AP ECET 2019 Hall tickets'. You will be directed to a new page. Enter your registration number and date of birth. The Hall tickets will be displayed on the screen. Download the Hall tickets and take the print out for further reference. Exam pattern: The question paper of AP ECET 2019 will consist of 200 objective-type questions. The candidates will be required to score at least 25 per cent aggregate marks in four subjects (three subjects for B Sc Mathematics) in order to secure rank. Who conducts AP ECET? : Andhra Pradesh State Council of Higher Education (APSCHE) has entrusted the task of conducting the prestigious entrance examination of the state "AP EAMCET" to JNTUK for the first time after the reorganization of the state of Andhra Pradesh. The APSCHE has instilled confidence and faith in JNTUK for the smooth conduct of the AP EAMCET for two times (2015 & 2016) in offline mode and two times (2017 & 2018) in online mode in the state of Andhra Pradesh. 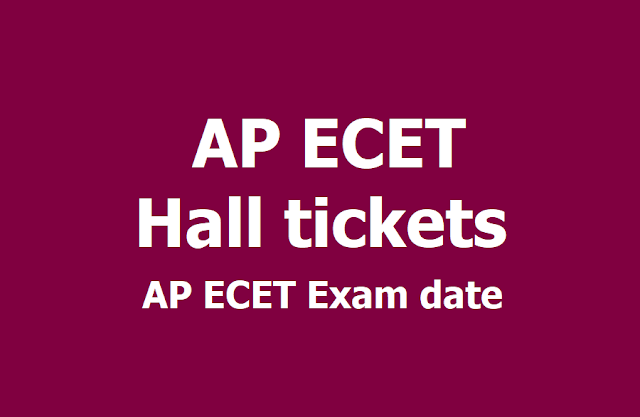 The Hall tickets for the Andhra Pradesh Engineering Common Entrance Test AP ECET 2019 are released , i.e April 11. Candidates who have registered for the exam can download the Hall tickets from the official website. The examination will be held on 30 April 2019 from 10 am to 1 pm. Candidates awaiting for the Hall tickets to be released must wait for the official update. The computer based test will be conducted by Jawaharlal Nehru Technological University (JNTU), Ananthapuramu on behalf of Andhra Pradesh State Council of Higher Education (APSCHE). The AP ECET exam is scheduled to be held on 30 April. Downloading of AP ECET 2019 Hall-tickets from the website https://sche.ap.gov.in/ECET/ 11-04-2019 onwards. Recently AP EAMCET 2019 Hall tickets have been released, as well. The exam will be attempted by those candidates who have Diploma in Engineering. Qualifying the examination will grant admission through lateral entry at 2nd year level into academic year 2019-2019. APECET 2019, APECET 2019 admit card, APECET admit card 2019, Andhra Pradesh Engineering Common Entrance Test, AP ECET 2019, AP ECET admit card, AP ECET admit card 2019. 1. The candidates can use either Blue ink Ball point pen or Black ink Ball point pen in the Examination. But the entire Examination must be written either in Black ink or Blue ink. Using both Black and Blue in the Examination is not permitted. 2. Candidates will not be admitted to the examination after 10.00 A.M. and not permitted to leave the hall before 01.00 P.M.
3. It is the responsibility of the candidates to ensure that they are answering the correct Question Booklet of the branch for which they are eligible for admission (for FDH candidates only). 4. The Question Booklet code, Hall Ticket No. and other details must be entered correctly and properly on the OMR Answer Sheet, in the Test. Otherwise ranks declared, if any, will be cancelled subsequently in such cases. 5. Candidates must return the OMR Answer Sheet after the test. They can take away the Question Paper booklet. 6. Question paper will be in English only. 7. Any malpractice case will be dealt with as per rules of CETs in force. 8. The OMR Answer Scripts of APECET -2019 will be preserved for six months from the date of publication of results after which time they shall be disposed. 9. In any litigation concerning APECET [FDH & B.Sc. (Mathematics)] 2019 ,the parties to be impleaded are Secretary, A.P. State Council of Higher Education, Hyderabad and Convener, APECET [FDH & B.Sc.(Mathematics)]-2019. 10. Any litigation concerning APECET [FDH & B.Sc. (Mathematics)] 2019 shall be within the jurisdiction of the High Court A.P., Hyderabad only. AP ECET applied candidates can download their hall tickets from the AP ECET Web portal.